This book offers readers the truth about the extensive navigational and maritime skills of the ancient Israelites and Phoenicians and reveals their worldwide reach. They established a network of colonies throughout the Mediterranean Sea in Western Europe the British Isles and North America. Considerable new evidence is offered to document the extent to which they explored North America in search for metals and raw materials to meet the need for Solomon's Temple and other building projects. Israel and Judah became two separate and often-hostile kingdoms after the United Kingdom of Israel fell apart during a very bloody civil war. The Kingdom of Israel gradually degenerated as a nation as they disobeyed God but remained a dominant naval power. The drought in Elijah's time stimulated the waves of Israelite migrations from their homeland and they founded new colonies for their people including Kirjath-Hade-shath (identified in modern texts by its Roman name: "Carthage"). Simultaneous with the rise of Carthage to power in the mediterranean world another new power rose to prominence in Asia. This new power was Scythia and its tribes were named Sacae. The term "Sacae" preserves the name of the Hebrew Patriarch Isaac fulfilling God's promise in Genesis 21:12 that Isaac's name would be placed on Abraham's "birthright" descendants. Scythia's Israelite origin is extensively documented. The names of many Israelite tribes and clans are present and identifiable among the Sacae tribes. The Scythians also renamed all of the rivers emptying into the Black Sea giving each one a name based on the name of the Israelite tribe of Dan. ISRAEL'S LOST EMPIRES The worldwide scope of Israelite/Phoenician Empire! 5.0000 out of 5 based on 1 ratings. WoW! This book was Exciting! I felt like i was Along with them in the Migrations.Lost Empires? No Way! 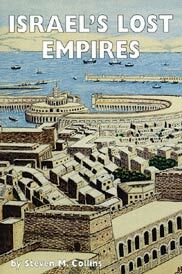 The Pheonician Factor Created Empires!DONT Hesitate on getting this book!5 stars!